Wigan Athletic’s new owners International Entertainment Corporation have paid tribute to the ‘exemplary fashion’ with which the Whelan family have conducted themselves during the sale of the club. The takeover – which has been ongoing for more than a year - reached the final stage on Friday morning following an overwhelming vote of approval from the IEC shareholders. And IEC chief executive Melvin Yan Min Zhang has placed on record his thanks for the smooth handover of power. “IEC has been in discussions with Mr Dave Whelan and chairman David Sharpe for some time now with regards the purchase of Wigan Athletic Football Club,” a statement read. “During this time negotiations have been conducted in exemplary fashion. 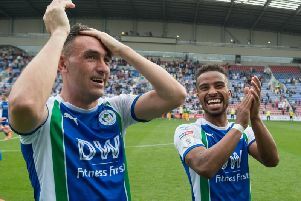 “The Whelan family’s ownership has had a profound effect on the success of Wigan Athletic Football Club over the past 23 years, and we would like to take this opportunity to place on record our respect for their achievements during that tenure. “Mr Whelan and his family will forever be associated with, and welcomed at Wigan Athletic Football Club and a further announcement in this regard will be made in due course.